J. Dupin, Mir, Barcelona and New York, 1993, p. 261, no. 284 (illustrated; location incorrectly listed as private collection, Japan). In 1936 the Spanish Civil War drove Mir into exile in France; four years later the fall of France to invading German armies forced Mir back to Spain. Because he was unsure how he might be received by Spanish authorities, he stayed with his wife's relatives in Palma Mallorca, and finally returned home to Montroig on the mainland in the summer of 1941. Mir began work on his celebrated series of Constellations in France in January 1940, during the so-called "phony" war on the western front. He continued work on this series during the invasion prior to his flight from France, and resumed painting them when he arrived at Palma. The final three were completed in Montroig, marking a personal and artistic odyssey that lasted a year-and-a-half. The Constellations resolve and ultimately transcend the antagonism of violence which characterized many of the works Mir painted during the previous decade. The anxiety and fear he experienced during the Spanish Civil War and the onset of the Second World War gave way to a greater sense of personal joy, and signify the triumph of art over worldly cares and human strife. The present work was painted at Palma only four months after the final Constellation. In this and other works of this period Mir moves away from the sheer density of visual detail that charactizes the Constellations: his line is freer and more expansive, and his color is more translucent. Nevertheless, he carries forward the essential elements of his personal mythology. The female figure personifies the earth and fertility; the star is emblematic of the larger cosmos; and the bird serves as an angelic intermediary between the two realms. 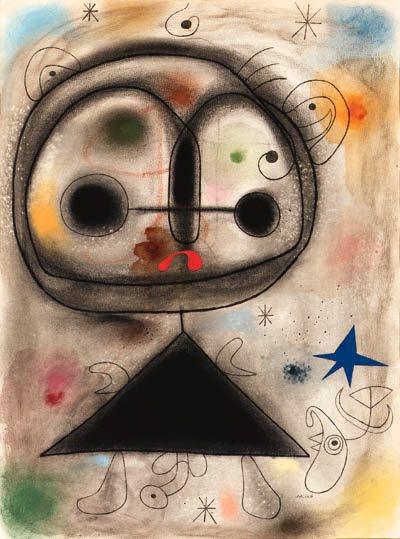 The present work and others of 1942 "are characterized by a freedom of invention and a marvelous effortlessness... In this new evolution of his art, which was to end in the creation of his definitive style, renewed contact with Spain after five years of absence -- with Mallorca most especially -- was doubtless crucial." (J. Dupin, Mir, New York, 1962, p. 369).